There are 2 places where a maximum file size can be determined. This one is defined on the sys.config.php configuration file. It acts as a default setting for all users and clients, including the main administrator. The limit set by default is 2GB. * Define a maximum size (in mb.) that is allowed on each file to be uploaded. * Encoding to use on the e-mails sent to new clients, users, files, etc. Change the value 2048 to anything you need. It must be an integer. The value is defined in MB in binary form, so if you need 1GB, then set it as 1024. Use this tool to quickly convert some example values to the one you could use. 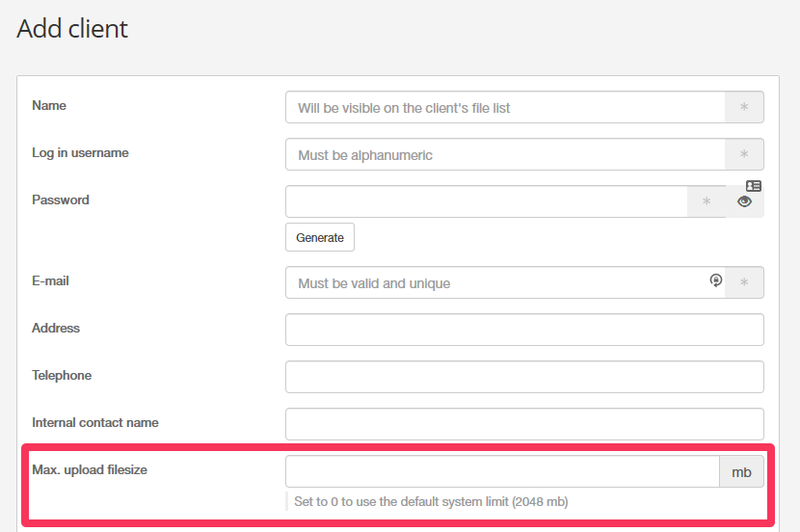 Starting from version r885, there is a new field on the clients and users add and edit forms. Labeled “Max. upload filesize” it works the same way as the global value, expressed in MB. If left empty or set at 0, it will use the global value.